I was a bit too early on Monday morning for the Melbourne Prize for Urban Sculpture 2014 as some of the sculptures had not yet arrived. The information stands were up and installation was underway but for a while the only thing that I could of the finalist’s sculptures were Geoff Robinson’s coloured poles (“spatial markers”) that are part of his work, 15 locations/15 minutes/15 days. Then I saw parked on the Russell Street part of the square, where the tour buses pick up passengers a polar bear on the back of the truck and the name of business: J K Fasham Pty Ltd.
J K Fasham Pty Ltd in Clayton South is a firm that specialises in architectural metal fabrication, mostly windows and doors. They have also fabricated and installed sculptures for over four decades and have done work on public sculptures for Inge King, Anthony Pryor and Deborah Helpburn. Moving a large sculpture is an expensive operation it itself and can be a major item in the budget for a sculpture. 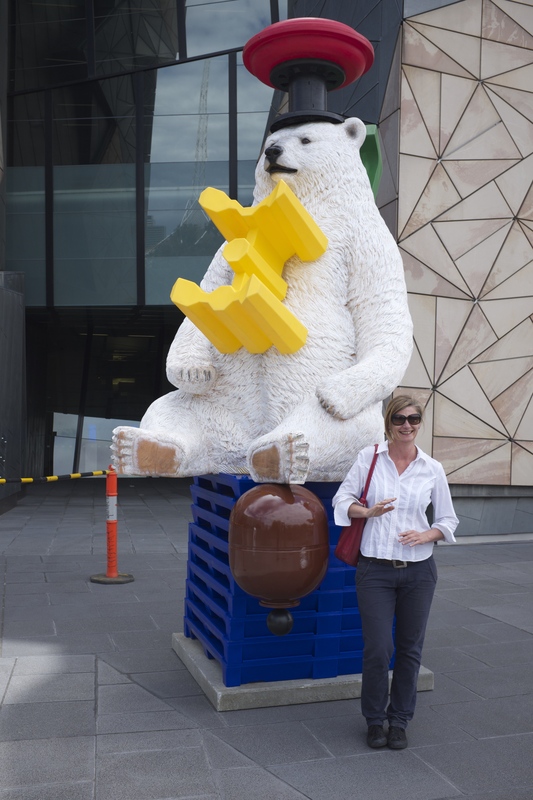 The polar bear was the most recognisable object in Louise Paramor’s Ursa Major, 2014, another one of the finalists in the Melbourne Prize. The sculpture is an assembly of unlikely objects, a chance encounter of the surreal kind in the warehouse that allows “industry, novelty and domesticity to collide”. The bear is seated on a stack of palettes, with a table balanced on its head and a slide on his back. 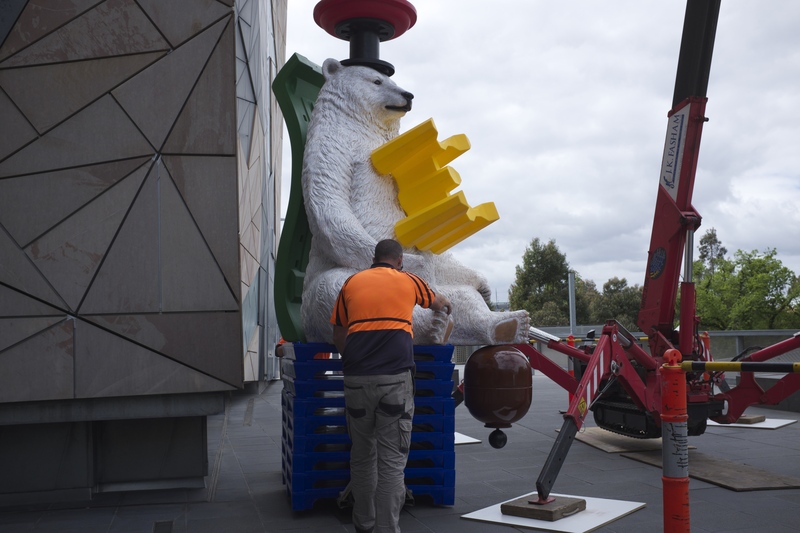 Considering the size of the plastic and fibreglass sculpture of the polar bear and objects and compared to some of the other sculptures that they have installed this was not going to be a demanding job. However, it was worth watching to observe a professional installation of a temporary public sculpture. 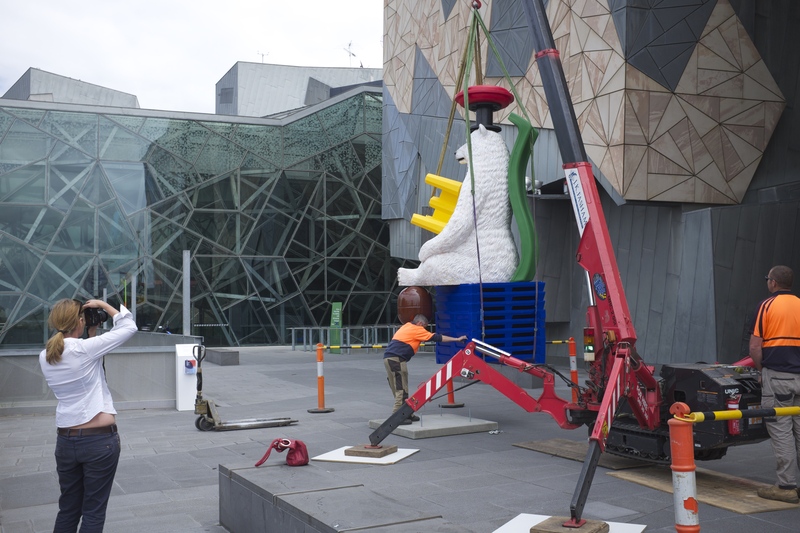 The sculpture is installed in a little used part of Federation Square at the back of the Atrium overlooking the Yarra River. It was a precision operation carried out with care, attention to detail and professional experience. The sculpture was attached to the concrete base with long steel bolts. 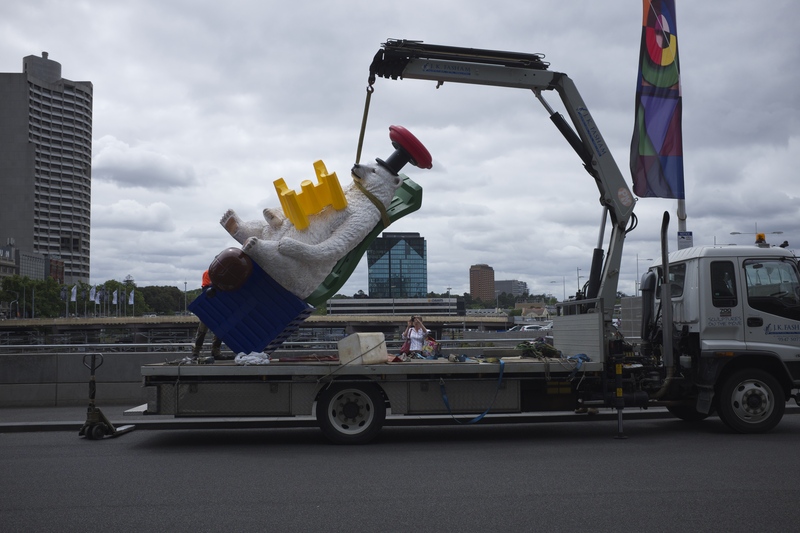 It was installed by two men, a truck with a crane, a pallet jack and another small crane. The second crane was a fantastic little piece of machinery, with retractable bracing legs that lifted the single track vehicle off the ground. It was perfect for the small pedestrian space. Everything went smoothly. Louise Paramor, the artist was watching and photographing the process. “We can still move it, if you want.” I heard one of the men say to Louise. In the end the biggest problem was where to put the laminated “Do Not Climb” sign and how to attach it. 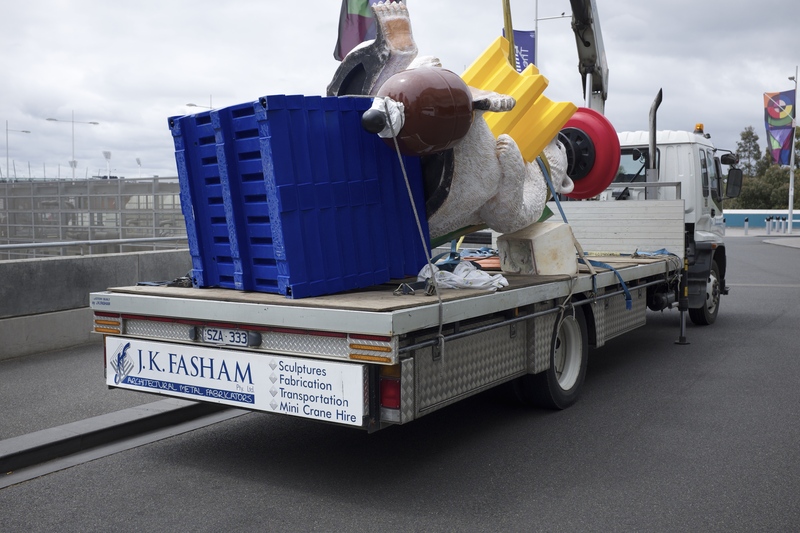 It was a problem for the artist and Melbourne Prize organiser, Simon Warrender; the two men from J K Fasham Pty Ltd were packing up the small crane and moving it back to their truck. 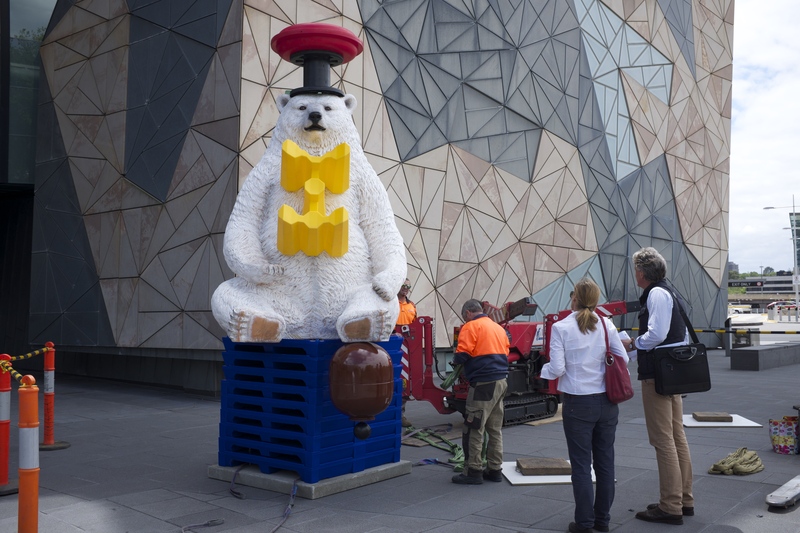 This entry was posted on Monday, November 10th, 2014 at 11:33 PM	and tagged with Federation Square, J K Fasham Pty Ltd, Louise Paramor, Melbourne, Melbourne Prize for Urban Sculpture, sculpture and posted in Public Sculpture. You can follow any responses to this entry through the RSS 2.0 feed.